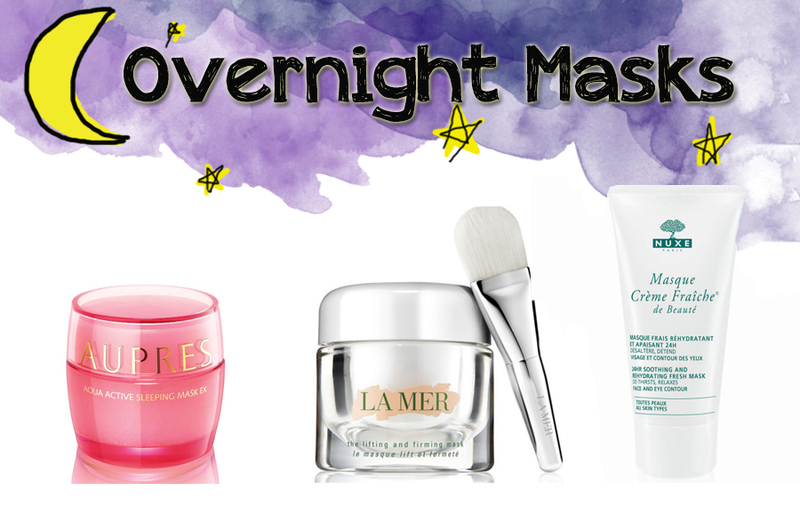 Let me preface this post by saying that I'm a fan of overnight masks, but I really just don't know how to fit them into my routine. I like what they are, but I don't know when to apply them! I use lots of skincare products - toners, serums, spot treatment creams, moisturisers - so when an extra product gets thrown in the mix, my routine gets a little 'off'. This is because you need to think product application through a little when you use your skincare - how long to wait before you apply moisturiser on top of serum, what products go on first so the other products absorb just as well as whatever went on before them, not to dilute something too much that it doesn't work, etc. For example, my spot treatment solution is supposed to be applied thickly onto my spots, but if a really thick moisturiser or mask is applied before it, then it doesn't get to treat and dry up my spot. And if it goes on before the mask, then the application of the mask will take a little of the treatment solution off, and then it won't be as effective. See my dilemma?! But that didn't stop me from testing out these masks, and I wanted to share reviews of them for you all, so you get a better idea of the kind of mask you would be best suited to (whether or not you're looking for one!). AUPRES is a less known, but much loved Asian brand that caters specifically to Asian skin. Their Aqua Active Sleeping Mask is a hydrating and renewing mask (having properties associated with the promotion of healthy cell division), and their latest version has been formulated with lavender to soothe and calm you whilst you sleep. To be perfectly honest, this didn't smell at all like lavender. Though the scent is beautiful, I am partial to natural scents, so this wasn't a particular favourite scent-wise. What it did do for me though, was moisturise my skin, well. Everytime I apply this mask, I wake up to more luminous, bouncy skin. One thing I didn't like about it? It doesn't dry down or absorb into the skin until much later, so if you're like me and love to sleep on your side or toss and turn around in your bed at night, then it can get a little uncomfortable and messy, because traces of the mask end up on your pillow and clothes. If you sleep on your back all night, try this one out! I previously reviewed the La Mer Moisturising Soft Cream and loved it (read more about it here), so I was more than happy to trial their new release - an overnight mask to help increase the skin's firmness and elasticity. The packaging itself is a sight to behold - a beautiful (and heavy!) transparent jar paired with a soft white applicator brush - and the product is an absolute dream to use. Simply spread a thin layer all over your face and neck, then massage it into your skin and follow with a moisturiser 10 minutes later. This mask absorbs into the skin, leaving behind velvety matte finish that won't affect your sheets or jammies. The strange, but pleasing thing about this mask, is that it's not just visibly plumper skin that I'm noticing with my twice-weekly applications; I've also noticed more radiant skin, and a more luminous overall look once I've applied my makeup. My skin just looks and feels a lot better, and I know it's this mask I have to thank for it. I have a soft spot for Nuxe products because of their beautiful PR girl back in Melbourne (hi, Emilie! ), and so when I got back to Malaysia and needed to pick up a hydrating mask for travel, I immediately ordered this one on Luxola. I had no idea that this was a leave-on mask, but when I found out, I tried it out overnight and loved the results! This mask can be a bit heavy if you're going to leave it on during the day when you're out and about, and wearing makeup, so I would definitely recommend using it at night for an intensive hydration boost, particularly on a plane or right after you've gotten off one. It does what it says - it moisturises the skin very well, and isn't too pricey so it's a great one to grab if you're on a budget.